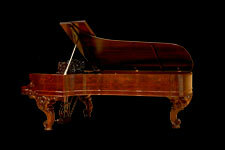 They are available in Ebony, Walnut, Mahogany or Unfinished. upholstery. All leg styles available. Mahogany, White, Ivory or Unfinished. On the inside, our silent "Micro-A-Just"
Size: 21 1/2" x 16 1/2"
on every artist bench we manufacture. construction from top to bottom. 16 1/2" to 23 1/2"
vinyl upholstered top for added comfort. Standard finishes include: Ebony, Walnut, Mahogany or Unfinished. 19 1/2" to 26 1/2".